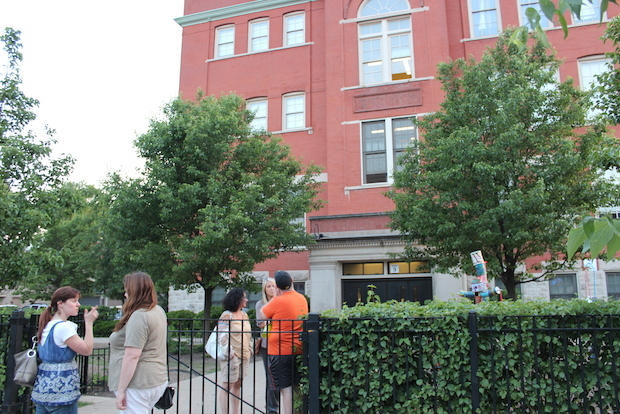 LAKEVIEW — A CPS distribution of more than 2,000 pink slips Friday included a music teacher, art teacher and an arts coordinator at Blaine Elementary. A total of 14 people were laid off at Blaine, said LSC community representative Kate Schott Bolduc. Eight of the positions were cut due to a $600,000-plus shortfall in the school's budget, a product of CPS's new per-pupil funding system that has instigated cuts across the city. Six other layoffs were based on programming changes partly due to overcrowding in some classrooms, Schott Bolduc said. Blaine's LSC has twice rejected its budget — once after an additional $100,000 grant was added — because they considered it "grossly inadequate." The budget is not yet final, and Principal Troy LaRaviere told staff laid off due to budget cuts that the school would be fighting to bring them back. Music teacher Colin McGeehan has been at the school for 10 years, according to a letter by LaRaviere that's posted on Blaine's website. McGeehan helped created a popular program called "Blaine Does...," where students perform based on a theme such as Broadway or the '80s. The concept ultimately won several grants from the Oppenheimer Family Foundation. He also spearheaded the school's strings program, which started with just violins in 2004 and ultimately grew to include viola, cello and guitar lessons for about 150 students. Art teacher Shana Ryback, also a 10-year veteran at the school, has worked closely with teachers all across the school to integrate art with other lessons, LaRaviere wrote. In math, students learned "to visually express multiplication tables" through photography. Science projects included sculptures and artistic representations of weather. And to learn about social studies, Ryback taught students the uses of masks around the world, LaRaviere wrote. "Blaine has established a fine arts program to rival that of ay neighborhood school in the City of Chicago," he wrote. "Losing any one of their positions would be a huge step backward." An arts-based science teacher, a middle school teacher, two teaching assistants, a clerk and a bus aide who also acted as an instructional assistant were laid off Friday. CPS spokeswoman Kelley Quinn said Thursday that the notices are not finalized. Individual school budgets are being reviewed, she said. It's possible that alternative funding sources such as a parent fundraising group can bring back one of the teachers before the school year starts. But Blaine, which has spearheaded a coalition of LSCs against school cuts, has refused to consider private funding until the city finds a way to minimize the gap for the whole system. "If we set this precedent of 'the parents will do this,' let's just call it what it is" — the privatization of public schools, said Tony Porfirio, LSC chair and a parent rep, at one meeting.